26 May 2016. Researchers from Sweden are developing software for controlling self-driving trucks, using the way animals react and adapt to their environment as a model. The team from Chalmers University of Technology in Gothenburg plans to demonstrate the package on Saturday, 28 May, in a Volvo heavy truck as part of the Grand Cooperative Driving Challenge in the Netherlands. The Chalmers researchers from its Research Vehicle Resource lab, a joint project of the university and Volvo with the regional government, took a different approach to designing control software for autonomous vehicles. Most software for self- or assisted driving vehicles is built to meet a specified set of functions, based on known driving patterns and activities. But problems — and crashes — can occur when the vehicle and its control software encounter scenarios they did not anticipate. Like most autonomous vehicle software, the system called OpenDLV gathers data from onboard cameras and sensors. But instead of feeding directly into one central control system, data are collected and processed by a set of smaller, independent modules. The modules then feed into a central controller that keeps the incoming data streams at a manageable level. OpenDLV also can learn from its incoming data, making it adaptable to unforeseen situations or dangers. Benderius and colleagues adapted OpenDLV from Open Davinci software, an open-source infrastructure package for cyber-physical systems, such as autonomous vehicles. OpenDLV — DLV stands for driverless vehicle — includes modules for hardware communications, safety and override functions, sensor integration, decision making, and visualization. The software is open-source and freely available. 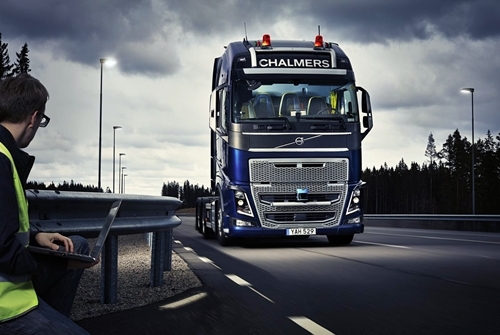 The Chalmers team fitted the software into a Volvo FH16 tractor-trailer cab, which they entered into the Grand Cooperative Driving Challenge, a Europe-wide competition for advances in self-driving vehicles, including vehicle-to-vehicle and vehicle-to-infrastructure communication. The 2016 competition takes place on 28 May, on a section of highway between Helmond and Eindhoven in the Netherlands.